The great Billy Sheehan returns to his progressive roots with Sons Of Apollo. Why have one bass neck when you can have two, he asks us. 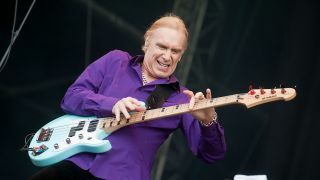 Billy Sheehan is one of the busiest bassists on the planet, showing no signs of letting up even though he’s in several active bands – the Winery Dogs are currently preparing for a packed 2019 schedule; the embers of Mr Big are still aglow following the untimely passing of drummer Pat Torpey; and of course there’s Sons Of Apollo, at whose London gig we met him recently. “I love to play; it’s my favourite thing in life,” says Sheehan. “People send me their YouTube clips and I tell them they have to play with people on stage, in front of an audience. You don’t need to be all that ready to play live, but get in a band and get to work! Although he’s now 65 and has been a professional musician for 40 years and more, Sheehan still sees room for improvement in his own playing. Sons Of Apollo boasts a stellar line-up, including drummer Mike Portnoy and keyboardist Derek Sherinian, both formerly of Dream Theater. What does SOA offer to the prog genre in Billy’s eyes? “There are funk and blues elements to this band, but inevitably, there are time changes and some free-form stuff in it too. I’m definitely old-school prog. I saw The Lamb Lies Down On Broadway with Peter Gabriel which was pretty amazing; when the first King Crimson album came out, that changed everybody. “But when progressive music came out, it was a way to get beyond the basic chordal thing that we were stuck in. We got into a lot more improvisational stuff; Cream obviously caught a lot of people’s attention. They were brilliant, and they came up with a lot of great stuff. In typical prog tradition, Billy has opted for a double-neck Yamaha Attitude for the live shows, although for the recording of the SOA album, Psychotic Symphony, a standard black Attitude tuned BEAD was used. 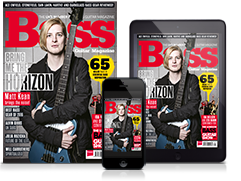 Was it problematic adapting to the double-neck instrument? “I used the black Attitude that I’ve used on a zillion records, so I recorded the whole record with that. They asked me to do a solo in the live set, but that bass doesn’t have the range that I’m used to. Sons Of Apollo’s live set is particularly demanding, and even a player of Sheehan’s standing has to put in the preparation. “Before this European tour, I hit it pretty hard and did my homework. I have to commit everything to memory, so I go over and over songs, especially if they’re complex. I really want to own them and be able to play them without thinking. As well as requiring a different type of performance, Billy’s tone has also undergone a change for this project, which has been aided by his Line 6 Helix unit. “It makes things a lot easier and a lot less precarious when travelling around; with analogue gear, and I did travel around with the Pearce preamps a lot, at one point the power supply transformer broke loose inside and smashed around. Keep your eyes peeled for a new Attitude, too, he tells us. “There’s a new bass coming! Cosmetically, the new bass is much different, and it will be paying tribute to my past,” he says, accompanying this with a nudge, a wink and some raucous laughter. Mr Big fans will be heartened to know that the classic band, now comprising Sheehan with guitarist Paul Gilbert and singer Eric Martin, hasn’t performed its last show yet, as their summer 2018 performances showed. “We honoured the bookings we had. We might go out and do something in 2019; we’re talking about it,” says Sheehan.